Silver Lake 28, Sabetha 7 – Silver Lake grabbed the momentum with a 41-yard touchdown pass from Ryan Matzke to Jace Freeman on the final play of the first half to break a 7-7 tie. The Eagles then recovered three fumbles by the Blue Jays in the second half and added two, fourth-quarter touchdowns. Freeman had four receptions for 68 yards and two touchdowns, while Matzke rushed for 100 yards and passed for 160. Wellsville 11, Caney Valley 10 – Caney Valley took a 10-0 lead into halftime on a late Levi Wyrick touchdown run, but Wellsville responded with an 11-point third quarter and held on for the win. After a Bullpup turnover, Wellsville scored on a Daryon Winton run and got a two-point conversion to pull within 10-8. The Eagles defense then recovered a Caney fumble and Jared Klamm hit a 30-yard field goal to take a 11-10 lead at the end of the third quarter. Caney Valley drove inside the Wellsville 40 with just over a minute remaining, but Wyrick was stopped short on a 4th-and-4. Rossville 35, Centralia 14 – Rossville outscored Centralia 21-0 in the second half to advance with a 35-14 win. The Bulldogs broke the halftime tie in the third quarter on a 65-yard touchdown pass from Tucker Horak to Thatcher Horak on a ball that was tipped up by Horak and the defensive back and deflected to Horak. Thatcher Horak caught two touchdown passes and rushed for a third score. St. Mary’s Colgan 35, Galena 18 – After leading 7-6 at halftime, Colgan scored the first 21 points of the second half to take a 28-6 lead and take control. Ryan Cedeno passed for more than 150 yards, connecting with Ian Duncan six times for 120 of those yards. Andrew Stewart added a pair of touchdowns runs for the Panthers. Colgan defeated Galena 16-12 to open the season. Halstead 36, Chaparral 27 – Blake Beckett rushed for 237 yards and scored five touchdowns as Halstead held off Chaparral, 36-27. Halstead led 20-14 at halftime, but the Roadrunners went ahead 21-20 on a Shawn Nulik touchdown run. Becket responded shortly after with a 67-yard touchdown run to give the Dragons the lead for good. Halsted later stopped Nulik on a fourth-and –goal at the 1-yard line. Nulik passed for 207 yards and rushed for 66 yards and four touchdowns. Minneapolis 17, Hoisington 14 – Eric Yoxall connected on an 11-yard touchdown pass to Gage Mortimer with 19 seconds left to lift Minneapolis to a 17-14 win over Hoisington. The Lions’ final drive was aided by a pass interference penalty on a ball well-overthrown into the end zone. Even the final scoring strike to Mortimer was of some debate, but Motimer was ruled to be barely in bounds on the catch. Hoisington led 14-3 entering the fourth quarter, but the Lions scored to pull it within 14-11 before their final drive. Wichita Collegiate 61, Hesston 35 – Collegiate raced out to an early 14-0 lead on a touchdown run by quarterback Austin Waddell and a pick-6 by Jaques Williams. Hesston responded with a Grant Raleigh touchdown pass and touchdown run to pull within 20-14, but the Spartans would respond with Williams’ third touchdown and a late pass from Waddell to John Egan to lead 33-14 at half. The Swathers pulled within 33-21 on a Raleigh touchdown pass to Cole Rostetter, but the Spartans again responded with a Jack Larsen pick-6 and another Williams touchdown run. Williams scored four times on the ground and added 167 yards rushing. Raleigh ended a brilliant season with 81 rushing yards and two scores, and 337 passing yards and three scores. Scott City 55, Norton 20 – Scott City scored 27 points in the second quarter to take a 33-7 halftime lead in rolling past Norton. Trey O’Neil passed for 227 yards and two touchdowns and Wyatt Kropp led the Beavers with 73 yards rushing and two scores. Kropp also caught a 71-yard touchdown pass from Brett Meyer. Scott City’s defense also scored on a fumble and an interception return for touchdowns. 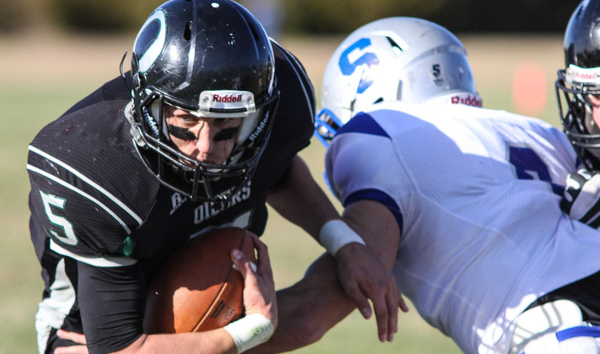 Osborne 58, Marais des Cygnes Valley 10 – Osborne scored 32 points in the first quarter to take control in a 58-10 halftime win over Marais des Cygnes Valley. Jake Tiernan completed 16 of 21 passes for 215 yards and five touchdowns on the day. He hit sophomore Cullen Grabast six times for 115 yards and a score, and connected with Brandt Wolters six times for 58 yards and four scores. Grabast also added 75 yards rushing and a touchdown. Hanover 62, Udall 14 – Udall took an early 8-0 lead before Hanover rattled off 20 straight points in a back-and-forth first quarter. At the end of one, Hanover led 28-14, but the Wildcats exploded for four touchdowns in the second quarter to take control 56-14. In that second quarter, Andrew Bruna threw three touchdowns passes and ran for another score. Bruna hit Evan Zabokrtsky on two touchdowns in that second quarter. Central Plains 42, Spearville 40 – Central Plains took advantage of four Spearville turnovers in holding off the Lancers 42-40 in a classic between unbeaten teams. The Oilers quickly grabbed a 14-0 lead after a Lancer fumble on the kickoff and a three-and-out. Central Plains led 28-16 at halftime, but Spearville pulled to within 28-24 on a Nathan Stein touchdown run, and grabbed their first led at 32-28 when Stein scored again with 8:35 remaining. Central Plains answered back one-play later when Layne Bieberle took a short Braedan Crites pass 55 yards for a score and a 34-32 lead. Jacob Warnken later intercepted a Spearville pass and the Oilers converted that into a 15-yard touchdown pass from Crites to Michael Lamatsch to lead 42-32. Stein scored with 50 seconds remaining to cut the lead to 42-40, but the Lancers were unsuccessful on the onside kick. Ness City 40, Little River 28 – Ness City built an 18-6 lead in the first half only to see Little River pull within 26-20 at halftime. The Eagles tacked on a pair of fourth-quarter touchdowns to lead 40-20 before Little River pulled to within the final margin. Tanner McMillen rushed for 131 yards and a score and passed for 148 yards and two touchdowns. Jacob Hoss added 101 yards on the ground and a touchdown. Axtell 42, Chetopa 34 – Axtell held off top-ranked Chetopa 42-34 to advance to the state semifinals. The Eagles built a 30-20 halftime lead and held on in the second half. Chetopa pulled to within 30-28 on a Sherrick Rogers interception return for a touchdown and 36-34 on a Philip Moses touchdown pass to Rogers. But Axtell answered with a Colton Buessing touchdown run and a 42-34 lead. The Hornets threatened twice later, but were stopped on downs and ran out of time. Buessing rushed for 156 yards and four touchdowns and passed for 150 more yards. Chetopa played without all-state running back/linebacker Derrick Cassell (6-1, 210) who suffered an ankle injury in Tuesday’s win over Caldwell. Cassell had 1,451 rushing yards and 31 touchdowns on the season and led the Green Hornets with 114 tackles. Cassell finished his high school career with 4,605 rushing yards 88 touchdowns, and 423 tackles. Argonia-Attica 56, Pike Valley 32 – Pike Valley and Argonia-Attica traded touchdowns for the first quarter and a half before the Titans took a 32-20 lead into halftime on a Devon Newberry touchdown run. The difference in those first-half scores was the Titans completing all four two-point conversions while Pike Valley was only good on one conversion. Pike Valley pulled to within 40-32 early in the fourth quarter, but touchdown runs by Alec McDaniel and Garrett Wells put the game away for the Titans. Victoria 64, Minneola 12 – Victoria rolled to a 64-12 halftime win behind a huge day from quarterback Brady Dinkel. All five of Dinkel’s completions went for touchdowns totaling 146 yards. Dinkel also added 102 yards and a pair of scores on the ground for the Knights. The Knight defense scored twice on a fumble return by Eric McAlonan and an interception return by Noah Dreiling. Sharon Springs-Wallace Co. 52, Ingalls 6 – Wallace County built a 38-6 halftime lead thanks to a 24-point second quarter. The Wildcats rushed for 216 yards on the night led by Nate Klinge’s 95 yards and two scores. Quarterback Eric Gfeller added 81 yards and a score and passed for 43 yards and three touchdowns.